Here you'll find just a few of the many excellent intermediate level ukuleles available. We've picked out a few that we think would be a good buy. 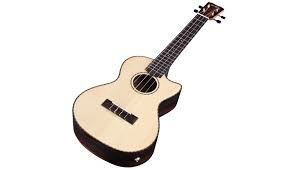 Most ukuleles at this level generally have either have a solid wood top, or an all solid wood construction. For more info about the differences this can make, including more info about the many tonewoods available, just take a look at our FAQ. The 22 Series applies the most popular guitar soundboard wood (solid spruce) with an exotic striped ebony back and sides. The aesthetic is subtle and refined with a Gloss finish, timeless hand-inlaid wooden rope rosette, and matching purfling. Comes with a triple padded gig bag. PRICED at $399. COMES with free Shipping AUSTRALIA WIDE with full insurance. Available in soprano (22S), concert (22C), tenor (22T), tenor cutaway acoustic-electric (22T-CE), and baritone (22B). The 21 Series applies the most popular guitar soundboard wood (solid spruce) with an exotic striped ebony back and sides. Model pictured with cutaway and Electric pickup.The aesthetic is subtle and refined with a satin finish, timeless hand-inlaid wooden rope rosette, and matching purfling. Comes with a triple padded gig bag. PRICED at $449. COMES with free Shipping AUSTRALIA WIDE with full insurance. Available in soprano (21S), concert (21C), tenor (21T), tenor cutaway acoustic-electric (21T-CE), and baritone (21B). The Makani mean wind in Hawaii. Breeze wind make people feel comfortable, and roar winds make people feel respectful. Play melody freely like wind, the Makani ukulele is design to meet performance ukulele playing.